It’s clear that I have a thing for cupcakes and since I post them so frequently, they are often the topic of emails that I receive from readers. Although I try to be thorough in the posts, sometimes I miss some stuff, like little tricks that make cupcake making a little simpler. I’m all about finding tricks to make life easier and this is definitely one of those. Last week I shared my go-to solution for hollowing out the center of cupcakes using an apple corer. This week I’m going to explain how I effortlessly ensure my cupcakes are almost perfectly uniform in size. My super secret trick is my large OXO Scoop. The large OXO scoop holds about 3 tablespoons of batter or cookie dough and I find it to be the perfect way to fill muffin and cupcake liners. No more fumbling around with piping bags, spoons, or pouring batter! With one simple scoop you’ll have perfectly measured batter every single time – and as a result, consistently sized cupcakes and muffins. The OXO scoops come in three sizes: small, medium and large. Small Scoop: The small scoop holds about 2 teaspoons of dough or batter is perfect for scooping truffles, small cake balls, or small cookies. Medium Scoop: The medium scoop also gets a lot of play in my kitchen and holds 1 ½ tablespoons of batter; which is typically the size I use when making the majority of my cookies. Large Scoop: The large scoop has a 3 tablespoon capacity and is perfect for cupcake batter, muffin batter, saucer-sized cookies and ice cream. You can purchase all these scoops via Amazon. I have also seen them at Bed, Bath and Beyond. If you purchase them from Bed, Bath and Beyond, be sure to check your mail for 20% off coupons. My local BB&B allows me to use up to five 20% off coupons for five different items. This may vary by store and region, but it’s a great way to save a few bucks! There are many different brands of scoops, Katie from goodLife eats loves her scoop from Pampered Chef, so that is certainly another brand to check out. This post is NOT sponsored by OXO. They just happen to the brand that I use in my kitchen and wholeheartedly suggest to my readers. This is a great trick. I’ve been using it for years. Portion control dishers are also available from local restaurant supply houses or online in a variety of sizes. They are often numbered based on the number of scoops per quart. For example, a #8 scoop is 4 fl oz (32 oz/8 scoops). Great info, Mikey! Thanks for sharing. When I make muffins, I sometimes use an ice cream scoop to portion it out. But I do have a cookie dough scoop… will have to try that! The beauty of the scoop is that is has a trigger, so it effortlessly forces the batter out of the scoop and into the muffin tin! It’s vintage Ovenex, you can pick them up in antique stores, on Etsy and Ebay. It’s the sunburst pattern. I second the Pampered Chef scoops. They changed my life. Seriously. This is awesome! I have been desperatly trying to make uniform sized cupcakes using measuring spoons for awhile now, and can never get them all the same. I’m in love with that cupcake pan too! It’s an amazing prop. I think I’ve seen that pattern on baking sheets as well. Thanks for the tip and the link to the oxo scoop! I just had to have one! Great information! I have just recently discovered how beautifully this method works. I’ll never go back. But your post has convinced me that I do need to purchase another size or 2! I have been using this method for YEARS!!!! I love doing my cupcakes this way. I NEVER have to worry about having to much or two little in the cups, they all cook at the same rate and it is just awesome. In fact I taught this trick to a couple of my cake deocarting friends. I own all the oxo sizes, but the 3tbsp one is the one I use for my cupcakes. THe only thing I will warn about is there are some REALLY stiff cookie doughs that you can break or unhinge that scraper bar, usually I can press it back in place but it does get dislodged at times when the cookie dough is crazy. For crazy hard cookie dough with lots of pieces (chocolate chips, cococut, etc) I use this scoop..the metal piece is hard enough to take it and it pushes the dough out in one piece. Doesn’t really work on softer doughs but definitely helpful. Thanks Jamie, I really do need to get these especially for cupcakes I tend to overfill so I am sure this will help me. cool idea ,thnks for sharing,..
Great post. 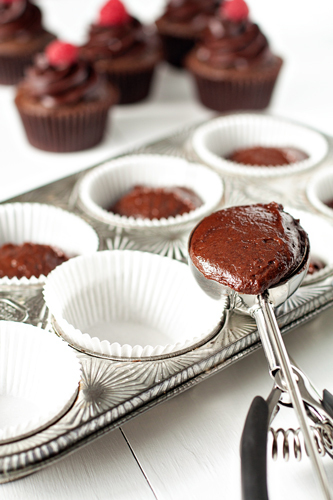 Just wondering which scoop would be best to use to fill mini-cupcake liners? Small or medium? What a great tip!! I usually use my 1/4 cup measuring cup, but this sounds even easier!! I love doing this with my large scoop too. The other thing I like to do sometimes is use my 1/4 cup measuring cup that has been sprayed with non-stick cooking spray. works like a charm! I, too, have the PC scoops, and I love them, but I think it’s just the scoops I love, not necessarily what brand they are. Great tip! I recently started using ice cream scoops in my kitchen, and I love how much easier it is to get uniform cookies and cupcake with them! Just know about this. Thanks for the tips!!! I use an ice cream scoop (even bigger than the OXO one) for muffins like this all the time and it works wonders! :) I like big muffins, though! omg i so needed this!! i have a hard time with my cupcakes coming out uniform thank you for the tips!! Thanks so much for stopping by, Kimberly! I use the large scoop and I almost always still have some cupcakes (on the same pan) that rise more then others…what causes this? thanks for the link to this site too! I use a ice cream scoop as well but sometimes getting it out of the scoop is my problem. Practice makes perfect! Thanks for sharing the size of your scoop. My scoop is too big. I’m gonna have to go shopping! Every time I make cupcakes or muffins, they get flat from the top, should try some of this site recipes… Thanks for this beautiful site. I really enjoyed these tips for uniform cupcakes! My friends and I are constantly baking and we always seem to have an array of sizes as far as cupcakes go! we always try using a ladle but I can see where this scoop method would yield much more uniform cupcakes. Are there any other methods you’ve found useful or is this the true go-to method? This is definitely my go-to method. Thanks so much for stopping by. Thanks for including a brand in this post. This is what I am looking for exactly! Nice little trick! I think I will go for the small and large versions! I’m on my way to BB&B! I don’t bake cupcakes more often because I always have trouble with the consistency of the size. Thanks! I am new at baking cupcakes so at the last minute I was searching for a way to make them all the same size. I didn’t have your suggestion at hand so I used my cookie scoop that holds 1tbs, I scooped twice in each liner and they came out at the right size. I think they would overflow if I used the 3tbs scoop, am I using a wrong liner? Maybe it’s too small? I got the regular wilton ones at the grocery store. Also, my cupcakes were about the same size, however they were sloped like a muffin, if I could get them to even out they would have been perfect. Is there anything I can do so that doesn’t happen anymore? i found a local store where they sell the scoop but it says #16, how do i know if that’s 3tbsp like you suggest or not? what # should i use? What size scoop would you recommend for the MINI – Cupcakes?? I think the OXO small scoop would be great! Thanks for stopping by. Can you please tell me how much will the cup cake weight if I use a large scoop. I have to bake cupcakes of each weighting 60gms for selling. Unfortunately, I’ve never weighed my cupcake batter, so I can’t answer this question for you. The cupcakes looks so freaking awesome. LOVE this recipe! Thank you Jamie. I wish you could make totorial video. That’s a great idea, Maria! I will look into it! Hi, Derek! You could try spraying your scoop with a bit of nonstick spray to see if that works. Good luck! I really must get one (or more) of these scoops. Have you also used a batter dispenser to make cupcakes? The ones that look like a plastic measuring jug and squirt the batter out with a squeeze handle? Do they work? Hi, Edwina! I’ve really only used the scoops for cupcakes. I really love them, and I think you will, too! I hope you enjoy them, Sakura! Hi! Can you tell me which scoop you would recommend for filling a mini cupcake? If you wouldn’t use a scoop what is the easiest way you’ve found to fill them? Hi, Sarah! The small OXO scoop should work wonderfully. You can also just use a spoon to fill the liners about 2/3 full. I hope this helps! What size cupcake/ muffin liners do you use? I’m new to baking and trying to figure out which size works best? Hi, Sandra! I use a regular 12 cup muffin tin with standard liners. I hope you enjoy the cupcakes! I’m sure they’ll be great! I will definitely have to buy a large and try this. I have the medium sized and have been trying to work with that. The downside is that it’s never filled the tins enough so I have to attempt to do a second “half” scoop and I think that’s where I lose it. A bigger size would definitely take care of that. Thanks for the amazing trick. I would be trying it asap! Thank you so much for this post! As an aspiring at-home baker, I continually struggle to make my cupcakes the same size. I have always seen bakers use a scoop, but never knew which one. Thank you thank you thank you! !